Tax reform may be coming to Arkansas in 2019. Whether the tax changes follow what Governor Asa Hutchinson proposed or what legislators want, Arkansans will likely be facing a restructured tax code. As I’ve written about on TAP, there are ways both good and bad to do tax reform. One thing that legislators should consider is the experience of other states. 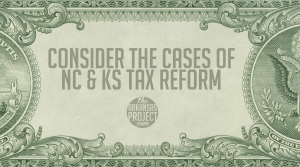 Olivia Gonzalez of the Mercatus Center at George Mason University recently wrote a piece that discusses tax legislation from two states, North Carolina and Kansas. As she points out, not all tax reform is created equal. Some states, like North Carolina, have done it well. Others, such as Kansas, have not. What reforms did North Carolina enact? Between 2013 and 2017, North Carolina undertook a series of tax reform measures. In 2013, the state changed its personal income tax from a three-bracket structure to a flat rate of 5.75 percent. It also cut its flat corporate tax rate from 6.9 percent to 5 percent, limited or eliminated dozens of tax exemptions, expanded its sales tax base, and repealed its estate tax. Since the implementation of these reforms, North Carolina has been able to improve its operating position so drastically that revenues exceeded expenses by 12 percent in 2016. This was the second best operating position that year, coming behind only Nevada. North Carolina’s net position has also improved, with its surpluses increasing from $296 per capita in fiscal year 2013 to $530 per capita in fiscal year 2016. This is especially impressive considering that most states experienced deficits in 2016, at an average of $72 per capita. Kansas lowered its tax rates and narrowed its tax base in 2012, running against the recommendation of prioritizing tax-system efficiency that many economists make. This reform was not coupled with any reductions to spending substantial enough to offset lost income, and it also included a pass-through exemption for the income of sole proprietorships that narrowed the state’s tax base while encouraging tax avoidance. The situation in Kansas has become a bit of a boogeyman on the political left to scare people into opposing any tax reform. Those who favor higher tax rates hold up that state as an example to condemn any type of reform. They do not stop to consider the particulars of Kansas’s actions and how it should have been done differently. Let’s hope that the issue of Kansas is not brought up too much in the upcoming legislative session. Merely because that state’s reforms did not, on the whole, work very well does not mean that Arkansas is doomed to follow the same path. The state can benefit from an improvement in its tax structure. As North Carolina shows, there are other examples of reform that show how well it can work.